2014 was the warmest summer on record here, and 2015 is off to a good start to beat that, with the hottest June on record. But then everything is relative, especially the lack of humidity here. My old bones actually feel great in the dry heat, and I worked like a dog right through the hottest days in early July…got to get those rentals painted, fixed and turned over to a new batch of renters. And every evening brings a long walk with the dogs along the cool, shady woods by the river and a swim in its refreshing clear water. So much for me; these two old timers are are enjoying a slow summer day, and they’re not the only ones. 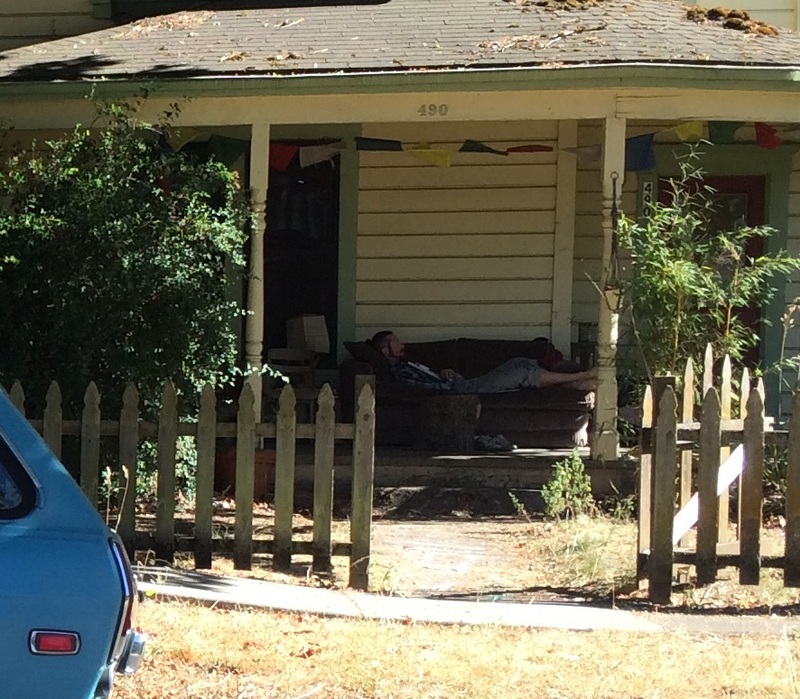 Someone’s taking a snooze in the shade of the porch. I have my favorite outdoor nap spot too, in a zero-gravity folding lounger out by the garden under the apple tree, but it’s not been getting quite enough use this summer. There’s something very primeval about looking out over one’s lush crops while dozing off. 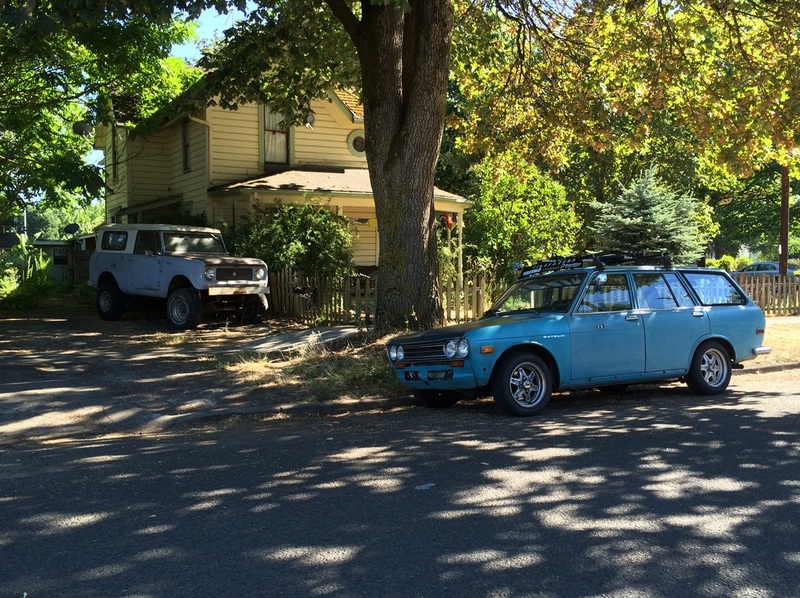 There’s still a fair number of Datsun 510s around. In fact, I’ve seen at least a couple of recent arrivals. The Chevettes may soon be gone, but these? Never. This is a pretty hoary old Scout, from the first generation. Not too many of these left, but the ones that are are also probably pretty safe. Thanks for this Paul. I’ve just managed an oil and filter change before the rain started. Holy hot dang it was hot and I work just over 40 hours a week in a lumberyard about a 100 miles north of Eugene. Shade is a rarity and I was drinking water like a fish while mixing it with Gatorade powder. There were about 9 days over 90 which almost broke a record, but o hear 2009 was hotter; 106 a few days. These are nice photos of peacefulness. Unfortunately, I’m too driven to take it easy in the summer. Last weekend (95+, high humidity) the wife and I spent Sunday paneling the garage so I could finally get my tools, bicycles, and other necessary stuff moved back in and turn it into a usable work space. This weekend will be no different, start moving the tools back in from storage, get the sewing room ready to hit the ground running 1 August – and hopefully take mama out on the Harley tomorrow for a few hours. We’ve had a few hot days the last couple weeks but other than those 5 or 8 hot days it has been an unusually cool wet summer here in Nebraska/Iowa. In fact, I think we’ve had oddly cold summers for the last several years. Works for me though. My body is happiest with temps around 40 to 50 degrees. I keep my house at 55 all winter long. I can do without summer all together except it hurts the economy around here. This is farm country and we live or die by the farmer’s good or bad fortune whether we are farmers or not. Farmers have a bad year and we all feel it. This year is a bad year for farmers and it looks like next year will be also. I’m about to move into a new-ish house. circa 1980 vintage. Mixed feelings about it. My old house has its faults but it has its charms. About a hundred years old with the original furnace…coal burner converted into nat gas. Huge cast iron grates in the floor for the heat and no blower. Its called a “gravity system”. No air conditioning…I am the only person I know who still lives without it. People think I’m quite strange. Antique farmhouse style kitchen. free standing gas stove. Huge free standing kitchen sink(no garbage disposal) with “drain boards” on either side of the sink. All hard floors. Plaster walls with wallpaper. Full height windows with old wavy glass panes. 10′ ceilings. 8″ tall mop boards. Questionable knob and tube wiring and lots of rusty old water pipes…and a huge old unfinished musty basement that smells like earth. I just finished going around spraying for weeds and trimming a few things here and there. I’m just tired of the upkeep I guess. I do not want to be here next time the windows all need to be re-glazed. Be prepared: you may need AC in the 1980-ish house. Those high ceilings and tall windows do a good job of separating the heat from the humans. The tighter and lower new houses force you to occupy the same space as the heat. I lived for 20 years in Oklahoma, mainly in those spacious old bungalows with wide overhangs and deep porches. Never needed AC. Now I’m in a tight little house in Spokane. AC is an absolute necessity even though most summers here are a lot cooler than most summers in Okla. Mid winter here not that its really cold heavy frost as I look thru the window but thats all nice snow capped mountain ranges off in the distance, my BBQ space has been usurped by a rusted out Hunter wagon I’m harvesting but that will be gone before summer gets here which is also the work season around here so not much lazing about for me I hope. The 510 is interesting. The performance fans have understandably picked up the 2dr survivors. 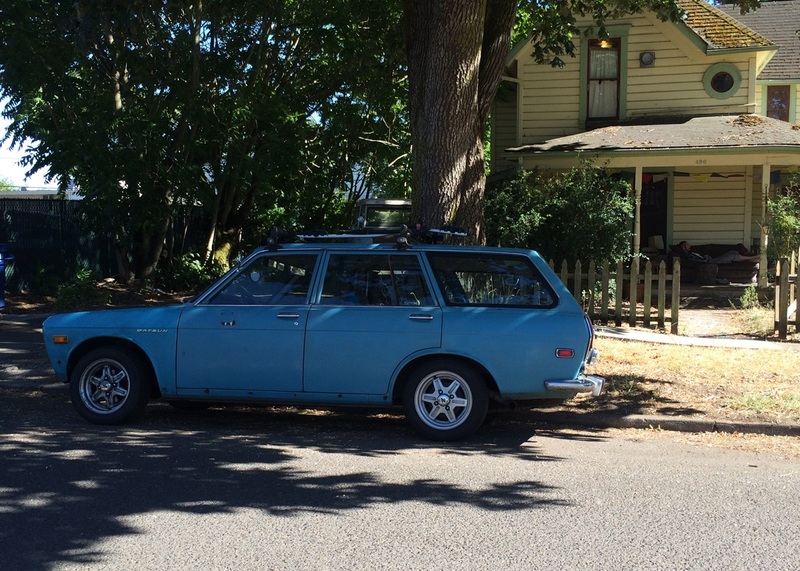 To see a utilitarian wagon with the mag wheels and the removed front bumper, that might take a little getting used to. Have a great summer. Here in GA the heat and sand gnats would get you. I still walk though, just sweat more. 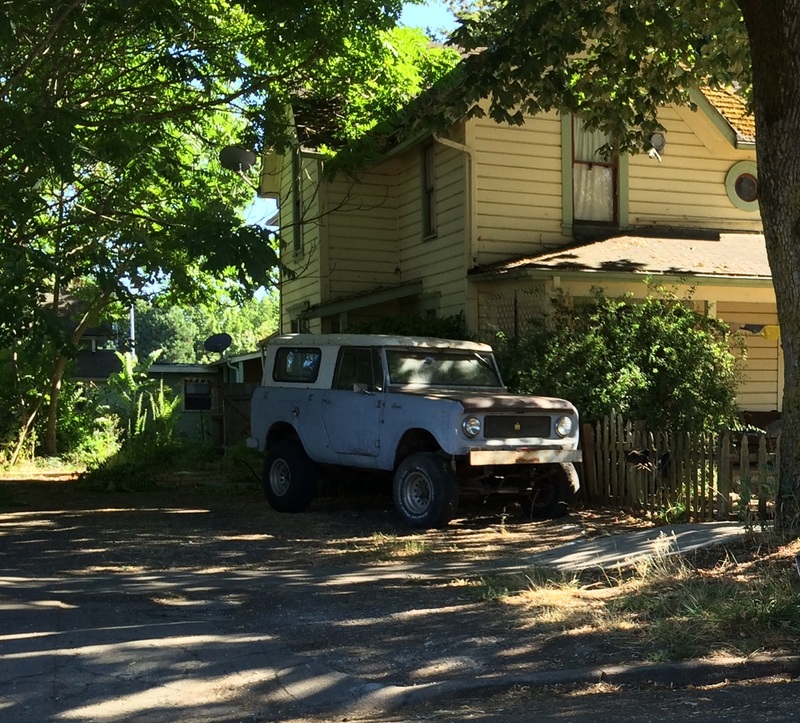 That old couch and house looks like the one they used on an album photo of Crosby Stills and Nash. 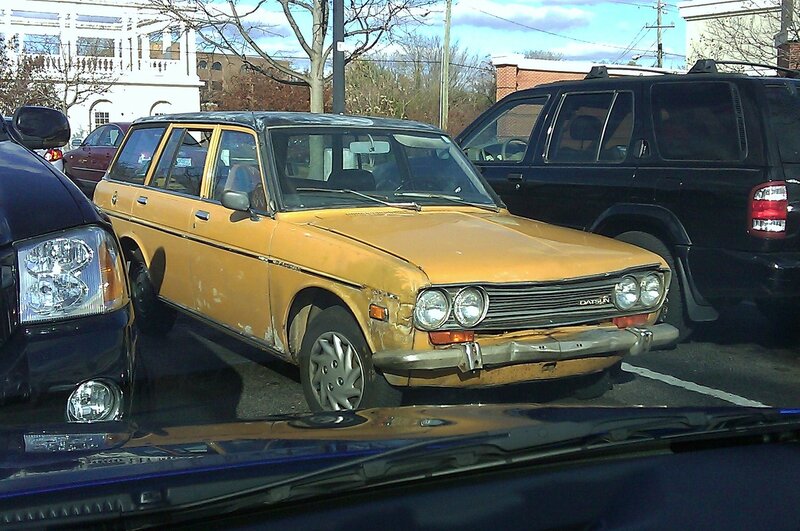 Datsun 510s are worth saving. Chevettes, maybe not so much although there really does need to be a few in museums. I’d put them in next to the Renault Dauphines and Yugo GVs.